Recent MAE graduate Nick Salamon has earned recognition for his research performed as an undergrad.In the movie “Interstellar,” a team of astronauts travels through a wormhole in space in an attempt to ensure humanity’s survival. For recent aerospace engineering grad Nicholas Salamon, the film provided more than just entertainment—it inspired his undergraduate research. “There’s a part in the movie where the crew is just starting off on this long, arduous journey into space and one of them is really nervous, so another astronaut gives him some earbuds with nature sounds playing and it calms him down,” said Salamon. That scene, coupled with what he recalls as a very realistic rock climbing simulation experience, got him thinking about how virtual reality (VR) could have a positive impact on mental health in space. Mental well-being, while important for all humans, is especially crucial for astronauts due to the intense nature of their environment, Salamon said. It is particularly vital on long-haul missions to the moon or NASA’s future journey to Mars, during which crews would experience much more autonomy and isolation due to their distance from their home planet. Under the guidance of advisor and Neil A. Armstrong Chair John Horack, Salamon produced his first manuscript, “Application of Virtual Reality for Crew Mental Health in Extended-Duration Space Missions.” The paper quickly caught the attention of others in the field and in the fall of 2017 he traveled to Adelaide, Australia to present his initial work at the International Astronautical Congress (IAC), the world’s largest gathering of space professionals. Soon after, Salamon reached another milestone: his first-peer reviewed publication. His paper was published in the interdisciplinary space journal Acta Astronautica. Salamon says the versatility of VR technology makes it ideal for many different applications in space, including relaxation, exercise and socialization. Rather than exercising while staring at the wall of their spacecraft, astronauts could jog through a forest or even their hometown. Instead of just sending text-based messages to family and friends, they could virtually interact with their loved ones in a VR social space, although real time communication will be impossible on trips to Mars. Salamon’s undergraduate research was funded by Ohio State’s Battelle Center for Science, Engineering and Public Policy. Without the support and opportunities provided by the center, Salamon said his work on VR would not have been possible. 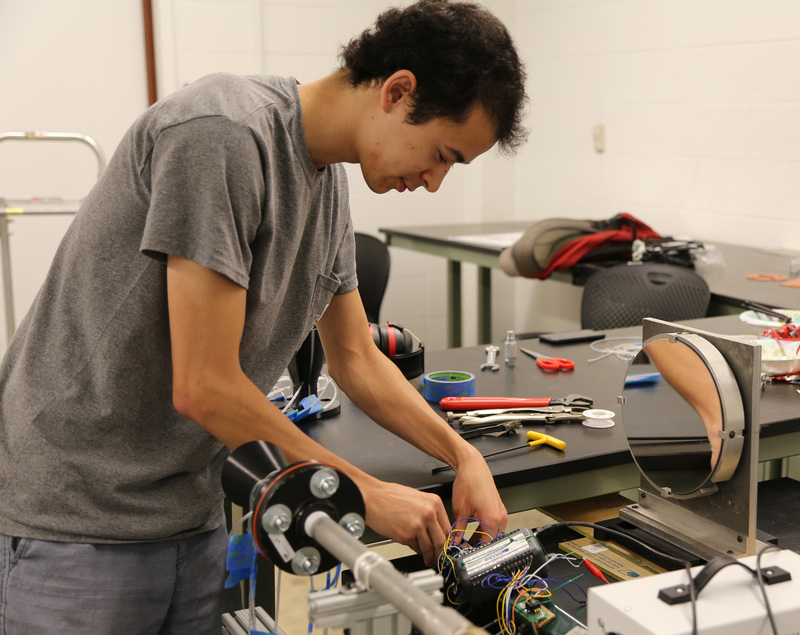 Salamon works in his lab on a prototype for his graduate research on nuclear thermal propulsion.“It’s been one of the most important organizations I’ve ever been a part of because they offer not only opportunities to travel, they’re giving their expertise and their connections to bring opportunities to students,” he said. 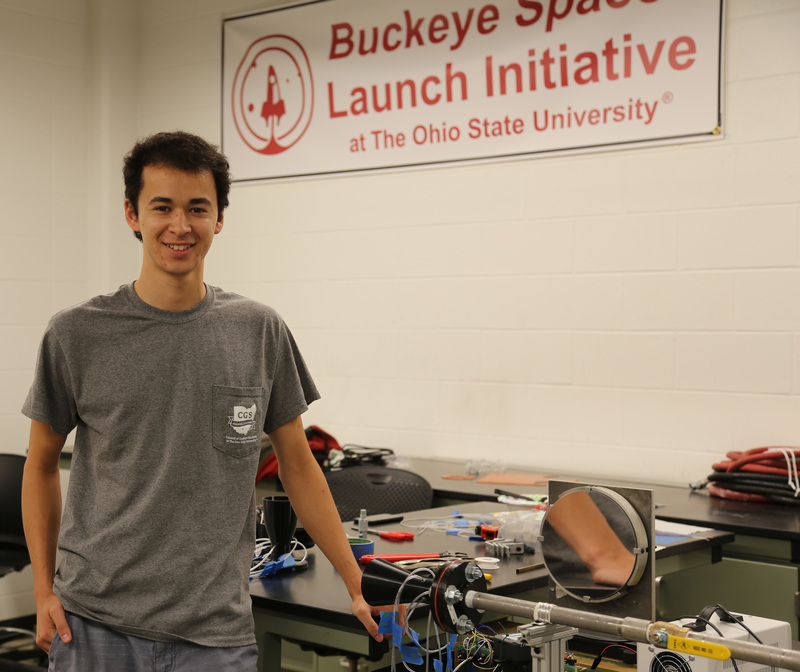 Now working toward his graduate degree at Ohio State, Salamon’s research is currently focused on nuclear thermal propulsion (NTP). Whereas most rockets used today utilize a chemical reaction for space propulsion, a NTP gets its energy from a nuclear reactor. “NTPs have never flown before, so there is a lot of R&D that needs to be done before it can shoot into the sky,” Salamon said. He’ll present his current work related to his master’s thesis at the next IAC in Germany later this year. And although he’s taking a break from VR for the moment, he doesn’t rule out exploring the topic again in the future. “Space is what I want to do in some capacity,” he said. For Salamon, the stars, not the sky, are the limit.